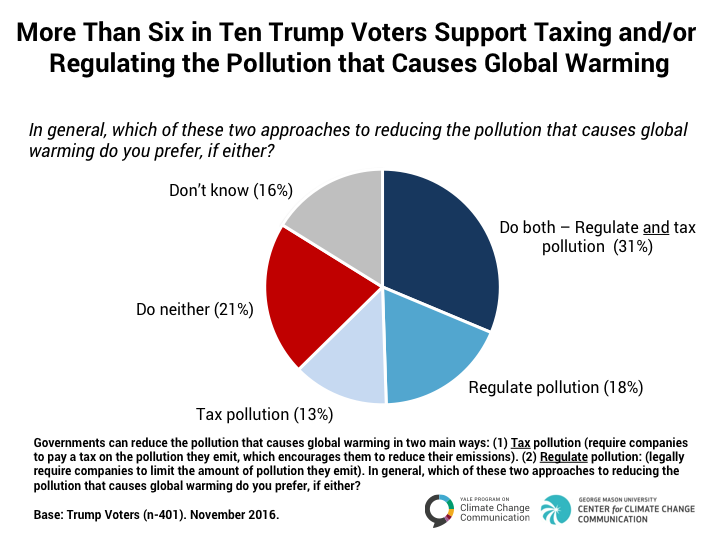 About half of Trump voters (47%) also say the U.S. should participate in the international agreement to limit global warming. By contrast, only 28% say the U.S. should not participate. For example, about half of Trump voters support requiring fossil fuel companies to pay a carbon tax and using the money to reduce other taxes by an equal amount (48%), and support setting strict carbon dioxide emissions limits on existing coal-fired power plants to reduce global warming and improve public health, even if the cost of electricity to consumers and companies would likely increase (48%). On clean energy, about three quarters of Trump voters support generating renewable energy (solar and wind) on public land in the U.S. (77%); say that, in the future, the U.S. should use more renewable energy (73%); support funding more research into clean energy (71%); and providing tax rebates to people who purchase energy efficient vehicles and solar panels (69%). These findings come from a nationally-representative survey (Climate Change in the American Mind) conducted by the Yale Program on Climate Change Communication and the George Mason University Center for Climate Change Communication. The survey of 1,226 American adults, aged 18 and older, was conducted November 18 – December 1, 2016 on the GfK KnowledgePanel.